3 June 2014. 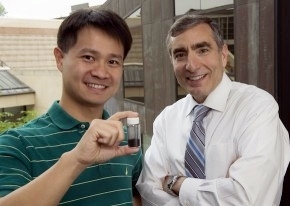 Chemists and materials scientists at Rice University in Houston developed a material that inexpensively extracts and captures carbon dioxide, or CO2, from natural gas wells at ambient temperatures. The team led by Rice chemistry and engineering professor James Tour, including colleagues from National Institute of Science and Technology in Maryland, published their findings today in the journal Nature Communications (paid subscription required). Rice University filed four patent applications on the technology. Apache Corporation that funded the research licensed the intellectual property from the university. Natural gas, when extracted from wells, normally contains 20 to 40 percent carbon dioxide by weight, which needs to be separated from the gas and normally vented into the atmosphere, adding to greenhouse gas emissions and contributing to climate change. Current methods of separating carbon dioxide from natural gas use corrosive ammonia-like materials called amines in scrubber towers that require energy-intensive processes at high temperatures. Tour and colleagues designed an alternative process for removing carbon dioxide from natural gas, based on compounds made of carbon-based polymer infused with sulfur or nitrogen. These precursor compounds, discovered by graduate student and first author Chih-Chau Hwang, are then treated with potassium hydroxide and heated to 600 degrees Celsius to produce a porous powder polymer material that under pressure captures up to 82 percent of the escaping carbon dioxide. The porous material, say the authors, has a high surface area — about 2,500 square meters per gram — which gives it a large storage capacity for carbon dioxide. In addition, the polymer composition of the material repels methane and related hydrocarbon molecules in the natural gas, trapping the carbon dioxide in the materials pores. Under ambient conditions, the stored gas can be separated from the polymer and released into sequestration areas underground. In the following video, Tour tells more about the new material.